Oct 22, 2018 - APIs for Liberty BASIC ebook - Alyce Watson has relaunched her wonderful ebook on Lulu.com! This great work shows how to unleash the power of Windows operation system calls with Liberty BASIC to do amazing things. Check it out here! Sep 9, 2018 - Win a free copy of Liberty BASIC - Until the end of October 2018 you can get Liberty BASIC by referring your friends to our contest. Click for more info! Jun 14, 2018 - Liberty BASIC Pro v4.5.1 released! - This maintenance release of Liberty BASIC includes bug fixes and a few enhancements. the file currently under edit in the Liberty BASIC IDE. programs under the Setup menu. Added source code coloring to the debugger code pane. Added display of global variables when debugging a sub or function. A checkbox in the debugger turns this on/off. editor toolbar so that you can change the font size quickly. Liberty BASIC was not loading. variable names that have periods in them will be properly selected. This improves the way that the new variable highlight works. May 31, 2017 - Liberty BASIC v4.5.1 released! - This maintenance release of Liberty BASIC includes bug fixes and a few enhancements. To get your copy click here! August 11, 2015 - Liberty BASIC v4.5.0 released! - This exciting new release of Liberty BASIC increases memory available 14x over the previous version, adds new string functions, the ability to fetch web pages, and new code editor enhancements. Download your copy now! Click here. New string functions make it easier to do some things and with faster performance. Removed arbitrary limitations on the baud rates that can be specified when opening a serial port. Upgraded to NTPort v2.8 from v2.3 to add compatibility for 64-bit versions of Windows. The Liberty BASIC editor now remembers its size and location when you start LB. Added a filter bad characters feature in the LB editor help the compiler, especially when code is pasted in from a web browser. Increased the FILEDIALOG length of the file path from 128 to 260 which is the Windows file dialog maximum path length. Added FIND, FINDBACK, and RESETFIND commands to the text window and texteditor control. April 10, 2015 - Updated tutorial links - The links to our newsletter tutorials were broken and are now repaired. Click to visit the tutorials page. April 6, 2015 - Live Liberty BASIC video chat on YouTube this Saturday April 11 - Go to youtube.com April 11 at 12:30 and search for CarlGundel (one word). The link to the live chat will appear in the results. See you there! Feb 8, 2013 - New Vector 2D Math Library - Thanks to community member Anatoly for this cool and useful math library. Click for more information. Jan 8, 2013 - Facebook Like button added - A new Facebook Like button has been added to the Liberty BASIC site home page. Please help to promote Liberty BASIC by Liking our web site. Thank you! Oct 18, 2012 - Win a free copy of Liberty BASIC by taking part in our referral campaign! - Have 5 friends send an email to freeoffer@libertybasic.com explaining that you referred them. They need to mention your name and email address. Please try to refer friends that have a real interest in programming. We will send you a free download link and registration code. This offer is good until the end of October 2012! July 2, 2012 - Liberty BASIC v5.0 alpha testing begins! - This is a limited private alpha testing phase. Initial testing will be Windows only, and then Linux and Mac versions will follow. Public beta testing will begin in a few months. Purchasers of Liberty BASIC v4.04 will receive an upgrade to v5.0 for free when it is released. Apr 14, 2012 - Joystick and gamepad input - Rod gives us the low down on the hardware and how to use it with Liberty BASIC. Read more. Feb 22, 2012 - Safe Directories for File Writing - Alyce touches on Windows security and special folders for keeping user files. Read more. Feb 5, 2012 - Using Initialization Files - Alyce explains how to use the Windows API to read and write INI files. Read more. Jan 23, 2012 - Numbers in Liberty BASIC - Anatoly explains all you ever wanted to know about numbers but did not know whom to ask. Read more. Dec 29, 2011 - Get DOS short filename - Alyce shows us how easy it is to get an 8.3 filename from a long filename. Read more. Nov 17, 2011 - Running Control Panel Applets - Alyce give a quick overview of how to launch Windows Control Panel Applets from your Liberty BASIC programs. Read more. Oct 19, 2011 - Enhancing Liberty Basic Array Handling - Dennis McKinney explains advanced array and memory techniques. Read more. Oct 3, 2011 - Chat Window Prototype - Alyce explains the basics of how to put together a chat application. Read more. Aug 18, 2011 - QCard DLL - Alyce updates her card game programming tutorial. Read more. July 27, 2011 - Transferring Images with TransparentBlt - Janet Terra demonstrates some advances image transparency technique. Read more. July 20, 2011 - Using Callbacks with Liberty BASIC - Alyce explains how to use callbacks. Read more. Jun 12, 2011 - Retrieving HTTPS Data by BrentDT - This demo reads a remote file into memory. Read more. Jun 10, 2011 - Clipboard API Demos by Alyce and DennisMcK - How to handle text, bitmaps and wavs with the clipboard. Read more. May 23, 2011 - Multiple-Timer Routines by nukesrus21 - A more sophisticated way to use timers with your programs. Read more. 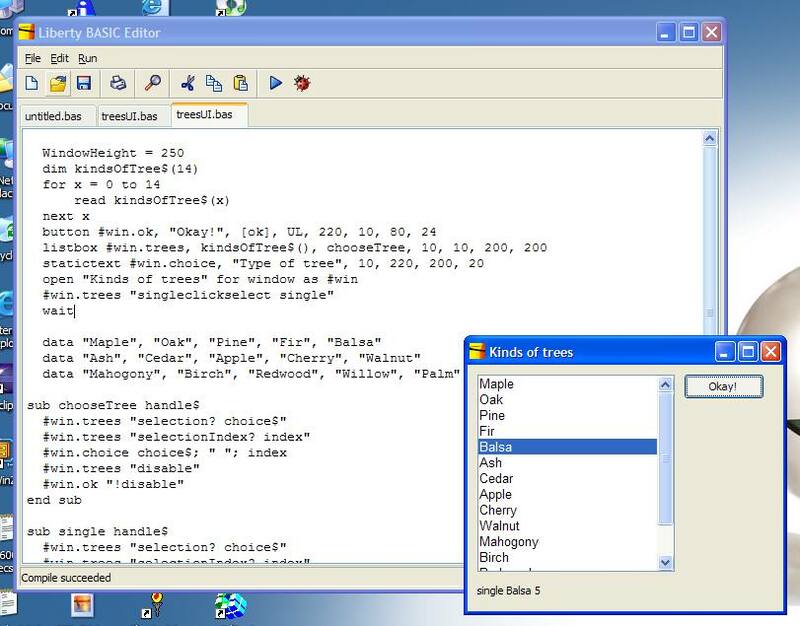 May 23, 2011 - API Animation Control by Alyce - Using the Windows built in animation control. Read more. May 8, 2011 - Allowing only one instance of your program by StPendl - Preventing more than one copy of your program running at once. Read more. May 5, 2011 - Retrieving installed drive letters Alyce - Using the Drive$ variable to get the list of drives for your Liberty BASIC program. Read more. May 1, 2011 - Another look at hard copy printing by Rod Bird - Another great article on graphics printing. Read more. Apr 20, 2011 - Hard copy printing with graphics by Alyce - How to send draw graphics and send them to a printer. Read more. Mar 31, 2011 - Changing the icon by Alyce - How to change the Liberty BASIC runtime application icon. Read more. Feb 27, 2011 - Graphic segments by RodBird - Getting to grips with graphic segments. Read more. Jan 15, 2011 - Saving JPGs by mike_ukmid - Saving and loading JPGs with a free DLL. Read more. Sep 2, 2010 - Accessing the Serial Port by RodBird - A complete guide. Read more. Aug 20, 2010 - Understanding and Plotting Polar Coordinates by Steelweaver52 - "How one might draw polar graphs in Liberty BASIC programs". Read more. Aug 10, 2010 - Plotting a function by tsh73 - Once upon a time there was a person who wanted to plot some graphs. Read more. Aug 7, 2010 - New Liberty BASIC Pro! - We've integrated the popular Assist tools into Liberty BASIC to create Liberty BASIC Pro. Learn more. July 31, 2010 - Liberty BASIC v4.04 released! - This new version is designed for Vista and Windows 7 compatibility and has bug fixes. Download here. Dec 7, 2009 - New Liberty BASIC book! - We're pleased to announce that Beginning Programming with Liberty BASIC is now available for purchase online! This is a great first programming book and is suitable for use with both Liberty BASIC and Just BASIC. Click here to learn more about the book and to purchase your copy online. Oct 9, 2008 - Flight Simulator in Liberty BASIC! Tom Nally has just released an open source flight simulator written in Liberty BASIC. This one blows the doors off the old classic flight simulator written in Microsoft BASIC. Check it out here. Oct 30, 2006 - New edition of Dummies book - Wallace Wang has produced a new 4th edition of the Beginning Programming for Dummies book! Oct 7, 2006 - New videos page - We have begun to post helpful flash videos showing Liberty BASIC in action. Learn about using the editor, the debugger and the cool interactive tutorial. Click here to watch them. Jun 22, 2006 - Liberty BASIC plugged in PC Magazine! - Bill Machrone wrote a piece in his editorial column recommending Liberty BASIC. Check it out and add your thoughts to their discussion area! Click here. Jun 21, 2006 - Liberty BASIC for Linux Sighted - For those interested in how the Liberty BASIC port to Linux is coming along, check out these screenshots. Click here! Apr 6, 2006 - Liberty BASIC presented to NYC Smalltalk Users Group - We were invited to present on how we develop our Liberty BASIC software to the NYC STUG. The presentation was on Thursday, Apr 6 and it went well. The attendees were impressed and had very good questions. Mar 19, 2006 - Liberty BASIC v5.0 Screenshots - We posted some early development screenshots of our upcoming Liberty BASIC v5.0. Here they are for Windows, and for the Mac. Jan 2, 2006 - Liberty BASIC Assist Released! - This exciting new add-on for Liberty BASIC gives you more power to create great software. Assist adds project management, application deployment, source versioning, color coded visual differencing, performance profiling, and source code formatting for just $49.95. Read more! Dec 17, 2005 - Liberty BASIC Newsletter 139 is out! - This new issue contains the following articles. To read this mammoth and terrific issue and more than 100 others, visit the Liberty BASIC Newsletter site at http://babek.info/libertybasicfiles/lbnews/! Nov 2, 2005 - Liberty BASIC Newsletter 138 is out! - This new issue contains the following articles. To read this mammoth and terrific issue and more than 100 others, visit the Liberty BASIC Newsletter site at http://babek.info/libertybasicfiles/lbnews/! Oct 3, 2005 - Liberty BASIC Newsletter 137 is out! - This new issue contains the following articles. To read this mammoth and terrific issue and more than 100 others, visit the Liberty BASIC Newsletter site at http://babek.info/libertybasicfiles/lbnews/! Sep 8, 2005 - Liberty BASIC Newsletter 136 is out! - This new issue contains the following articles. To read this mammoth and terrific issue and more than 100 others, visit the Liberty BASIC Newsletter site at http://babek.info/libertybasicfiles/lbnews/! Aug 15, 2005 - Liberty BASIC Newsletter 135 is out! - This new issue contains the following articles. To read this mammoth and terrific issue and more than 100 others, visit the Liberty BASIC Newsletter site at http://babek.info/libertybasicfiles/lbnews/! July 1, 2005 - Liberty BASIC Newsletter 134 is out! - This new issue contains the following articles. To read this mammoth and terrific issue and more than 100 others, visit the Liberty BASIC Newsletter site at http://babek.info/libertybasicfiles/lbnews/! June 4, 2005 - Liberty BASIC Newsletter 133 is out! - This new issue contains the following articles. To read this mammoth and terrific issue and more than 100 others, visit the Liberty BASIC Newsletter site at http://babek.info/libertybasicfiles/lbnews/! May 21, 2005 - New Liberty BASIC for QBasic Users forum - If you're a QBasic user, you'll find this new forum helpful for your Liberty BASIC projects. Different topical categories for language syntax, graphics, files, etc. will help you master Liberty BASIC quickly. Come and check it out! May 9, 2005 - Liberty BASIC Newsletter 132 is out! - This new issue contains the following articles. To read this mammoth and terrific issue and more than 100 others, visit the Liberty BASIC Newsletter site at http://babek.info/libertybasicfiles/lbnews/! Mar 6, 2005 - Liberty BASIC Newsletter 130 is out! - This new issue contains the following articles. To read this mammoth and terrific issue and more than 100 others, visit the Liberty BASIC Newsletter site at http://babek.info/libertybasicfiles/lbnews/! Feb 6, 2005 - Liberty BASIC Newsletter 129 is out! - This new issue contains the following articles. To read this mammoth and terrific issue and others, visit the Liberty BASIC Newsletter site at http://babek.info/libertybasicfiles/lbnews/! Oct 7, 2004 - Liberty BASIC Newsletter 125 is out! - This new issue contains the following articles. To read this mammoth and terrific issue and others, visit the Liberty BASIC Newsletter site at http://babek.info/libertybasicfiles/lbnews/! Sep 19, 2004 - Liberty BASIC v4.01 Released! - Run, do not walk, to our download page and get the latest version of Liberty BASIC! This release has improved printing and mouse support, and also some general fixes to make this the best Liberty BASIC ever. Note to registered users of v4.0: Just download and install this release and it will automatically recognize your user registration. Aug 28, 2004 - Auto Email Responder Project - Ken Harding has launched an open source email responder project using Liberty BASIC! Check it out at http://www.boke.co.uk/! Aug 23, 2004 - New DLL Site Launched - DLL4LB is a new site that manages a list of great DLLs you can use with Liberty BASIC. There's something there for everyone. Click here to check it out! July 30, 2004 - Liberty BASIC Newsletter 123 is out! - This new issue contains the following articles. To read this mammoth and terrific issue and others, visit the Liberty BASIC Newsletter site at http://babek.info/libertybasicfiles/lbnews/! July 10, 2004 - Liberty BASIC University restarts! - The online course Introduction to Programing using Liberty BASIC is scheduled to begin on Monday July 12! Click here for more information. June 26, 2004 - Liberty BASIC Newsletter 122 is out! - This new issue contains the following articles. To read this mammoth and terrific issue and others, visit the Liberty BASIC Newsletter site at http://babek.info/libertybasicfiles/lbnews/! June 12, 2004 - Liberty BASIC Newsletter 121 is out! - This new issue contains the following articles. To read this mammoth and terrific issue and others, visit the Liberty BASIC Newsletter site at http://babek.info/libertybasicfiles/lbnews/! +Demo: Updated LB Contact Manager - By Ken Lewis Sr.
May 15, 2004 - Liberty BASIC on the Radio! - Tech Watch Radio interviewed the creator of Liberty BASIC on their radio show! Listen to the interview and find out about the special price for Tech Watch Radio listeners! Click to listen (MP3 format audio). Jan 3, 2004 - LB Newsletter 116 is out! - This new issue contains the following articles. To read this mammoth and terrific issue and others, visit the Liberty BASIC Newsletter site at http://babek.info/libertybasicfiles/lbnews/! Nov 22, 2003 - Liberty BASIC v4.0 released!! - We've just released the best Liberty BASIC ever! If you're a registered user, you can upgrade to v4.0 for just $19.95! Download the trial version here. code examples you can run from inside the lessons! +New updated user interface look and feel! +Columnar printing with commas now supported! +New GLOBAL statement permits declaration of program-wide variables! +New BYREF keyword supports pass by reference into Subs+Functions! expressions in your programs dynamically at runtime! code stepping, and also new breakpoint support! +Now set the LPRINT printer font using the PrinterFont$ variable! graphics to the size of the page! +New PLAYMIDI command so you can play MIDI music files! position relative to its absolute position. +Handles for files, windows, etc. can now be dynamic, which permits more reusable code! +Now events can be handled by subs and not just by branch labels! Sep 29, 2003 - Liberty BASIC University Now Open! - Now you can learn programming in Liberty BASIC in our online classroom for just $29.95 (registered Liberty BASIC users only $19.95). Our first class is entitled Intro to Computer Programming with Liberty BASIC and starts October 6! For more information visit LBU here! Aug 9, 2003 - LB Newsletter 111 is out! - This new issue contains the following articles. To read this mammoth and terrific issue and others, visit our new Liberty BASIC Newsletter site at http://www.libertybasicuniversity.com/lbnews! May 26, 2003 - Liberty BASIC v3.03 released! - This latest version of Liberty BASIC adds new example programs courtesy of the Liberty BASIC community. It includes a new revamped version of the FreeForm GUI editor. It also raises the quality of Liberty BASIC even higher with carefully implemented bug fixes. This is the highest quality LB ever! If you already are a registered user of Liberty BASIC v3.0, v3.01, or v3.02 your registration code will work on this new release. Just download,install and enjoy! Apr 30, 2003 - LB Newsletter - SPECIAL FIFTH ANNIVERSARY issue #108 is out! This new issue contains the following articles. To read this mammoth and terrific issue and others, visit our new Liberty BASIC Newsletter site at http://www.libertybasicuniversity.com/lbnews! Apr 26, 2003 - New Liberty BASIC Chat room! Now you can chat in real-time with other Liberty BASIC users. Come get to know our online community! Click here! Feb 23, 2003 - We've updated our games page! Check out the cool games on our games page written by users from our online community! Click here! +Documenting Your Code the Easy Way! Sep 18, 2002 - Liberty BASIC v3.02 released! - If you've been waiting for the right time to try the latest version of Liberty BASIC, then download v3.02 today! This is the best version of Liberty BASIC ever with lots of nice new features! We also have a new pricing and licensing structure with SILVER and GOLD licenses starting at just $29.95! June 7, 2002 - Liberty BASIC a winner at the Isidor Awards 2002! Since Liberty BASIC managed to be in the top 3 in their Development Tool category, it will be included in their promotional CDROM and also on the cover CDROM for the German magazine Chip! Click on the image to learn more. May 30, 2002 - Free Liberty BASIC 3 Word of Mouth Contest! - Until June 15 we're giving away Liberty BASIC 3 to anyone who can get at least five friends to contact us! Check it out here! May 21, 2002 - Check out the winners of the 2002 Liberty BASIC Challenge! - Go check there out here. We apologize for the delay getting this information up. May 2, 2002 - Cast Your Vote for Liberty BASIC 3 - Liberty BASIC has been entered in the Isidor Shareware Awards Contest. Please help Liberty BASIC to get the recognition it deserves by casting your vote. The more votes, the better chance that Liberty BASIC will win! Voting is easy. Just follow the link below. It will ask for your email address. After you place your vote they will send you an email to which you must reply to confirm your vote. Thanks for your support! Click here to vote for Liberty BASIC! Apr 24, 2002 - Liberty BASIC v3.01 released! - If you already have downloaded Liberty BASIC v3.0, or if you've been waiting for the right time to try the latest version of Liberty BASIC, then download v3.01 today! This is the best version of Liberty BASIC ever, and this maintenance release has important fixes, especially if you operate your computer outside the USA (there are important regional settings fixes in this version). Apr 10, 2002 - Liberty BASIC v3.0 documentation now online! Now if you want to get a peek at Liberty BASIC's features before downloading you can! Just click here to look at the complete help file on the web! Apr 8, 2002 - Liberty BASIC v3.0 is officially released! - Liberty BASIC v3.0 is now available for download! This new 32-bit release is 4x faster then Liberty BASIC v2.02 and runs on Windows 95/98/Me & NT/2000/XP! It has been called to my attention that Liberty BASIC University has not gone live. I am aware that a few people specifically mentioned an interest in the LBU, and that some registered requesting the free seats we offered on our web site. I would like to personally apologize for this unfulfilled promise. I still hope to launch this project, but it is still at least a couple of months away. If you registered hoping to participate in the LBU, please consider it your right to ask for a refund. I hope your experience with Liberty BASIC has been more than worth the purchase price and that we'll keep you as a valued customer. Again, please accept my apology for mishandling this matter. Until the LBU actually goes online, I will not again make the mistake of offering it as a product. Feb 5, 2002 - Development4life.net web site added to our Resources page! - This is a nice news site about Liberty BASIC and other things BASIC! Free Intro To Programming with Liberty BASIC enrollment with purchase of Liberty BASIC! - Nov 3, 2001 - We will give away a number of seats in our first Intro to Programming with Liberty BASIC course, which will be held later this month. This online class is suitable for the beginning programmer. To qualify, order a copy of Liberty BASIC (see the Order Online! link to the left), then email us at carlg@libertybasic.com. When we run out of free seats, we will post a follow-up message here on this news page. Liberty BASIC v2.02 released! - June 1, 2001 - This release has some important bug fixes and also adds support for READ, DATA and RESTORE. Download yours at http://www.libertybasic.com/download.html !! Hungry Minds announces a Liberty BASIC book! - March 18, 2001 - Waiting for a good introduction to Liberty BASIC that you can buy at the store? Here it is! The book is titled Beginning Programming for Dummies 2nd Edition by popular author and columnist Wallace Wang. The book presents a general introduction using Liberty BASIC examples. The book includes a CDROM with the shareware version of Liberty BASIC 2 and other goodies, including materials created by Side by Side Software. Hungry Minds is accepting advanced orders for the book, which will be released mid-April 2001. Click here to buy from Barnes and Noble!